Tested only in animals so far, the device — if it pans out it — could mark a new approach to treating brain diseases, reducing side effects by targeting only the hard-to-reach circuits that need care. WASHINGTON — Scientists have created a hair-thin implant that can drip medications deep into the brain by remote control and with pinpoint precision. Tested only in animals so far, if the device pans out it could mark a new approach to treating brain diseases — potentially reducing side effects by targeting only the hard-to-reach circuits that need care. “You could deliver things right to where you want, no matter the disease,” said Robert Langer, a professor at the Massachusetts Institute of Technology whose biomedical engineering team reported the research Wednesday. Stronger and safer treatments are needed for brain disorders ranging from depression to Parkinson’s. Simply getting medications inside the brain, past what’s called the blood-brain barrier, is a hurdle. It’s even harder to reach its deepest structures. Pills and IV drugs that make it inside trigger side effects as they wash over entire regions of the brain. So doctors have tried inserting tubes into the brain to pump drugs closer to their targets, but that risks infection and still isn’t accurate enough. The most targeted success to date is a cancer treatment, a wafer placed on the site of a surgically removed brain tumor that oozes out chemotherapy. The MIT team’s next-generation approach: a customizable deep-brain implant that can deliver varying doses of more than one drug on demand. The researchers constructed two ultra-thin medication tubes and slid them into a stainless steel needle that’s about the diameter of a human hair. That needle, built as long as needed to reach the right spot, gets inserted through a hole in the skull into the desired brain circuitry. An electrode on the tip provides feedback, monitoring how the electrical activity of targeted neurons change as the medication is delivered. 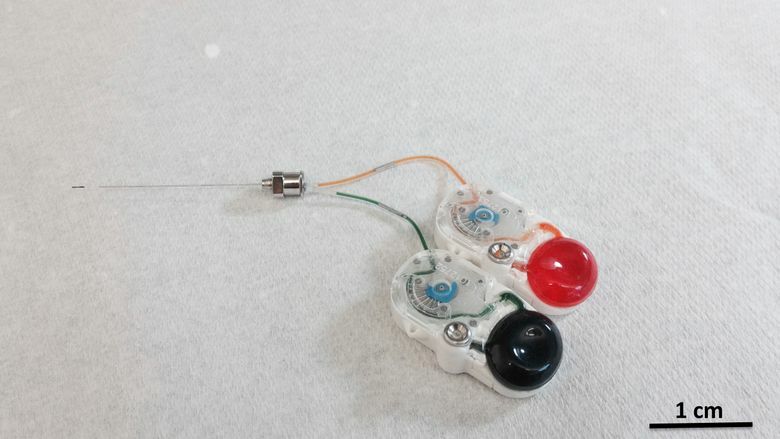 The needle is hooked to two small, programmable pumps that hold the medications. The plan: Thread the pumps somewhere under the skin for a fully implantable system, dubbed MiNDS for miniaturized neural drug delivery system. The pumps can be refilled with an injection, and if more than two drugs are needed, additional reservoirs could be added like in a printer ink cartridge, Langer said. Lab rats gave MiNDS its first test. Researchers implanted the needle into a movement-related brain region that Parkinson’s disease damages. To mimic that disease, the implant dripped out a chemical that made the rats move abnormally, including repeatedly turning clockwise. Next, the researchers turned off that chemical and infused saline through the system’s second channel, ending the Parkinson’s-like behavior, MIT lead author Canan Dagdeviren reported in the journal Science Translational Medicine. Another experiment in a monkey showed delivering that same chemical into a different region altered how the targeted brain cells fire. “There’s a lot of therapeutic potential for this,” said Tracy Cui, a bioengineering professor at the University of Pittsburgh. She wasn’t involved with the MIT study but also is developing this kind of technology. Numerous groups are working on implants to deliver neurologic drugs in different ways, Cui noted. While additional testing is needed before such a system could be tried in people, she said these kinds of tools are important for research thanks to the feedback showing how neurons react to different compounds. The study was funded by the National Institutes of Health; MIT has applied for a patent.